The County Courthouse was built in 1855 or 1856 as the first public building in the area. Vaughn Nielson in The History of Box Elder Stake stated that the rock walls for the basement story were all laid by the fall of 1856. After these basement walls were laid up and window and doors installed, the structure was covered with a temporary roof, and the building was utilized for meetings and drama during the winter of 1856. In 1857, two stories of adobe brick were built upon this foundation, but before the walls were finished, a strong wind partially blew them down. These walls were then rebuilt and the building was completed before the end of 1857. 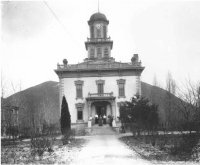 Lorenzo Snow, the leader of the community stated "by the fall of 1857 they had built the second and much better courthouse, the upper story of which was 45 X 65, while the original basement room was 22 X 45. He says the roofing of the new structure was fastened with wooden pins." The cost to construct this building came from donations or labor tithing. The men of the area were asked to spend one tenth of their time working, or were required to supply materials for the workers. George F. Hamson Sr. donated ten thousand adobes, William Wrighton, D.M. Burbanks and Peter Baird did carpentry work, Lars Stranquist did rock masonry work, and Joshua Holland did plastering work. These are just a few of those who labored on the building. As the only public building for a time, it had many uses: a church, a school, a dance hall, and a theater. Before the community was divided into wards (ecclesiastical boundaries) and separate churches were built, the people of the entire community met in the large upstairs room of the building for church services. It was the largest hall in town and had a gallery built into the entire west end of it with a choir loft under the gallery. A stage was located at the east end of the room and a table was placed on this stage which served as a pulpit during church meetings. When stage entertainment was held, public and church officials sat with their wives in the choir loft. After the towns division into wards, the fourth ward continued to hold church services in the courthouse. They met in the downstairs east room until 1880. School was taught in the downstairs east room of the building as late as 1880 and theatrical productions were staged first in the basement where the scenery was painted onto the walls, and later in the large hall upstairs where religious and social functions took place. County and City government meetings were also held in the early courthouse. 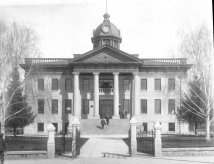 Brigham City was incorporated in 1867, and meetings with the mayor and city council at first took place quarterly, and by 1894 bi-monthly sessions took place. 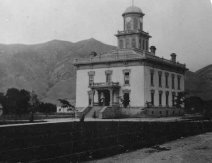 By the early 1870's there was a large bell which hung in the tower (on the roof) of the courthouse which signaled work time, lunch time, and quitting time with the Brigham City Co-operative enterprises. It also was a fire bell. Late in 1892, the old bell cracked and was replaced by a borrowed one. This one also cracked when it was rung too long celebrating Utah's Statehood on January 4, 1896. A town clock was procured in April 1887 for $433.15, and during this year the building was remodeled with a clock tower added plus Italianate detailing on the building. Around the turn of the century, the top floor of the courthouse was being used for the district courtroom, assessor's office, commissioner's chambers, sheriff's office, and judge's chamber. In January of 1910, a major addition to the front (west end) of the original adobe structure was planned by the county commissioners. Local architects Funk and Wells designed this Neo-Classical addition which included four large pillars and a larger clock tower in which the 1887 clock would be placed. S.A. Sackett was accepted to do the construction with the low bid of $67,521.00. The entire north part of the basement will be occupied by the recorder...The recorder will have a spacious office to accommodate the public, a copy room for the copyist, two large fireproof vaults and a cozy room off by itself and away from the copyists and public, for the abstractors and conveyancors...down to the basement into the sheriff's offices, consisting of two rooms on the west end, with a spacious room taking up the balance of the space on the east, which will be used as a jury room. Upon entering the building, the first floor door to the left opens to the clerk's office. [He also has a space for copyists and a vault]. On the right of the hall, is the district court room and judge's chambers. The court room is a large, well lighted room occupying the east half of the space, and the judge's chambers are on the west end, the first door to the right upon entering the building... form the district courtroom, a private stairway leads down to the basement to the sheriff's offices. The rooms now occupied by the Recorder and Clerk, will be made into one, or atleast they will be connected by an entrance through the wall that separates them, and those rooms will be occupied by the Treasurer. The Assessor will be moved down into the present quarters of the Treasurer. [The Board of Education will go into the top of the old adobe part of the building]. The Sheriff's and Assessor's offices are located in the basement; on the first floor is to be found the offices of the county Clerk, county Treasurer, Soil Conservation office, State Road Commission headquarters, the District Courtroom and Judges Chambers. The second floor houses the Daughters of the Utah Pioneer's relic hall, the National Resettlement office, the School Board offices, the Office of the District Agricultural Inspector, and the headquarters for the County Extension Division. In 1949 the tenants at the courthouse were about the same with some shuffling around of office places. K.B. Olsen, a former county Clerk and Auditor for 32 years has provided information: On the lower level, the recorder's office was still in the northeast corner, then across the hall the Sheriff's office had become the Driver's License office with the jury room located behind it where it had always been. To the east of the jury room was the county Commissioners offices. In the east end of the building (the oldest part) was the Surveyor's office. On the main floor, the county Clerk's offices were still located in the northwest section of the building, and so were the Judicial offices and District Courtroom which were across the hall. In the east end of the building was a small law library and the Treasurer's and Assessor's offices. On the top floor, the Board of Education occupied most of the 1910 addition except a U.S.U. Extension Office in a southwest office. in the oldest part of the building (east end) was located the Juvenile court plus the Daughters of the Utah Pioneer's displays in several of the rooms. A new clock was purchased for the clock tower in 1950. In 1960, another addition to the building was constructed. From January to September, a basement and main level structure of 1,530 feet was added onto the northeast part of the building, which was the original adobe part. The architect was Don Frandsen and the contractor was Wayne A. Jensen. This new addition would provide more office space for the Assessor and Treasurer plus additional office space in the basement. The Board of Education quarters on the top floor were also remodeled at this time - a section of the corridor was partitioned off for office spaces. The Daughters of Utah Pioneers relic Hall that had been located in several rooms at the top floor from 1928 until the 1940's became more visible when it was put behind a glass partition in the hallway of the basement in the year 1948. However, in 1978 when an elevator was put in to comply with the handicapped laws, the hallway was not wide enough to accommodate their exhibits. The exhibits were moved to the city's museum-gallery. The Board of Education also moved out of the courthouse in March of 1977 when it acquired an old church building for its offices at 230 W. 200 S.
#10- Commission Secretary's Office, Commissioner's Room, and Jury Room; #16-Surveyor and Inspection Department; #18 Driver's License Division and License Plate Division of the Utah State Tax Commission; #11-Recorder's Offices and Vault. #20-Judge's Office, Judge's Chamber; #22-District Courtroom; #24- Law Library; #26-Treasurer's Offices and Assessor's Offices with a common lobby; #21-Clerk's Offices. #30-U.S.U. Extension Offices; #32-Auditor's Office, #34-Red Cross and Hospice; #39-Health Department Offices; #33-JuvenileCourt; #31-Purchasing Department. In 1996, the State of Utah celebrated Utah's Statehood Centennial. Members of the Centennial Committee helped to plan events, renovations, and fund raisers. Small renovations were made to improve the appearance of the courthouse inside and out.Sales of centennial license plates, many fund raisers and a restoration grant helped to provide the monies to make the renovations. A historical calendar was created with old photos of buildings, farms, homes, and people of Box Elder County. A historical Photo Tour Book was generated by the Centennial Committee which also included hundreds of historical photos and history of Box Elder County. T-shirts, mugs, pins,belt buckles, key chains, blankets, shot glasses, posters, post cards, and other collectible merchandise was also sold. The renovations included new carpet throughout the courthouse, refinishing of the wood work on the stairway banisters, reconstruction of the old clock. The clock was put in a display case on the main level. Old historical photos were matted and framed and hung on the walls. These photos were sponsored by many local residents. A fresh paint job on the outside of the building, including all the detailing of the vines and beehive. A conference room on the top level was renovated and called the "Jay Room". Many historical items were donated and displayed by Jay Hardy, a county commissioner. The rest rooms received a much needed upgrade with new fixtures and tile. Repairs to walls and the outside adobe were also made. A beautiful mural of Box Elder County was painted by Jacque Baker, artist, a former Box Elder county resident. It was hung on the outer wall of the elevator on the main floor. Auditor's Office, Justice Court Offices, Justice Court Judge's Office, Justice Court Courtroom, Assessor/Treasurer (including the Motor Vehicle Division for license plates), and a Law Library. Personnel Office, USU Extension Offices, County Commission Offices, Commission Secretary's Office, Purchasing Department, County Attorney's Secretary, Deputy County Attorney's Office, and a new conference room (The "Jay" Room). A listing of "Those who have served" in elected and appointed positions may be found through this link. Please contact us if you find any information missing or inaccurate. After the Centennial, many other projects took place. Christmas lights and decorations make the County courthouse a very festive place throughout the holiday season. Lighted snowflakes hanging from the trees, Santa with his sleigh and reindeer flying to the roof, lights illuminating the windows, front pillars, and roof top, and trees draped with colorful lights have become a tradition enjoyed by all. Year round, the beautiful landscaping of the courthouse is also enjoyed by all. In 2007, improvements were made to the landscaping and preservation of the GI statue. On April 16th, 2007, removal of the old trees in front of the building was begun. The birch trees were first removed due to a tree boar problem. When the birch trees were removed, it was noticed that the pine trees were mis-shapen due to the growth of the birch trees. It was decided by the County Commission to remove the old pine trees as well. The pine tree to the South of the grounds was 82 feet tall, the equivalent to 13.666 6ft. tall men stacked on top of each other. The pine tree on the North part of the grounds was 77 feet tall. The removal of trees was sad to some, yet exciting to others. The view of the beautiful architecture of the building was now certainly the center of attention. New landscaping graced the beautiful structure. In 2007, the following departments held their offices in the County Courthouse. On the bottom level you would find, the Recorder/Clerk's Office, the Surveyors Office, the IT department, the Ag inspectors Office, and GIS Office. On the Main level, the Auditors Office, the Justice Court along with the courtroom, and the Assessor/Treasurer's Office which included the Motor Vehicle Division. On the top floor, the Personnel Department, the Building Inspection Office, the Commissioners Offices and Chambers, the Planning and Zoning department, the Economic Development Office, and theTourism Office.